8th pattern in the 12 Days of Woodland Creatures (and Their Favourite Things) project! Worsted weight yarn in lavender, blue and tan (or other colour combinations you like). Head is crocheted in rounds, while body is crocheted in rows. Round 1: With main body colour, 6 sc in magic ring, do not join. Round 2: 2 sc in each sc around (12 sc), do not join. Round 3: *2 sc in next sc, sc in next sc*, repeat from * to * around (18 sc), do not join. Now we start on the body. Row 1: continuing from the head, 1 sc in each of next 3 sc, turn. Row 2: ch 1 (does not count as a stitch), 2 sc in next sc, 1 sc in each of next two sc, turn. Row 3: ch 1, 1 sc in each of next two sc, hdc in next sc, 2 dc in next sc, turn. Row 4: ch 1, hdc in first dc, sc in each st across, turn. Row 5: ch 1, sc in first sc, 2 sc in next sc, sc in next sc, hdc in next sc, dc in last st, turn. Row 6: ch 1, 2 dc tog over next 2 st, 2 dc tog over next 2 st, hdc in next st, sc in last st, turn. Row 7: ch 2, skip first sc, 2 dc tog over next 2 st, leave remaining st unworked, fasten off, leave a long tail for sewing. Repeat pattern for the 2nd side of bird, but no need to leave long tail for sewing. With wing colour, 4 sc in magic ring, ch 2, work 2 dc tog by working 1 dc in magic ring and 1 dc in first sc, fasten off, leaving long tail for sewing when finishing one of the wings. Securely tie off the loose end of magic ring and weave in ends. 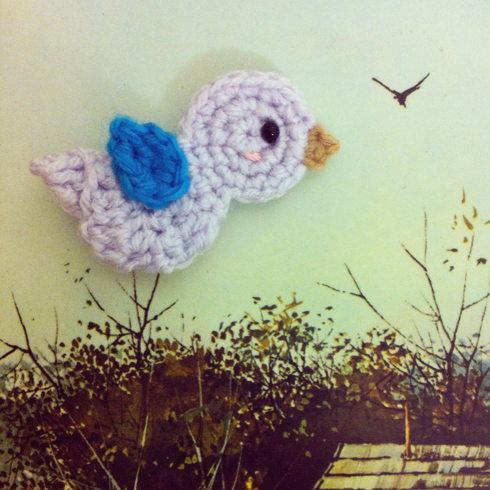 Sew eye and embroider rosy cheeks to each side of the bird. Sew the 2 sides of bird together. Sew wings to body. Weave in ends. Attach beak colour yarn to 5th stitch from the stitch where head and body meet, in the “chin” area of the bird. Inserting hook through both layers of the bird, ch 1, 2 sc tog over same st where yarn is attached and next st, ch 1, sl st in the top of the 2‐sc‐tog just made, sl st in the 2nd sc of the 2‐sc‐tog. Fasten off, weave in ends. Bird is ready to take flight! Have a fantastic week ahead, everyone! Come and Share your Amigurimi Stuff!!! Designers of Amigurimi: I like to meet you here! Are you going to attend? 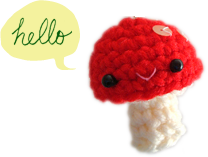 It is fun to show all your amigurumi’s you designed right here! Come, join and SHARE!! !